I haven't been posting as often as I'd like. The reason is simple; time, or the lack thereof. The past year has probably been the busiest year of my life. As I started this business in 2014, I also had a full time job as a designer which I continue to hold today. I'm also a wife to a man with many talents and ambitions, and a mother to an active 5 year old who needs and craves my attention always. I truly cannot thank my family and supporters enough for encouraging me to push through, and of course each of my clients who will always have a special place in my heart and have continuously supported my artistic vision. Even after major sleep deprivation the past few months, I can honestly say 2014 has been an amazing journey for me both personally and for my business, and I want to share with you where my heart is in this whole thing. I have only been behind a camera for three years. Yes, I know that some people might think I don't deserve this; that I simply don't have the experience, or that I suddenly picked up a camera and called myself a photographer. That's simply untrue, and while I am absolutely still learning daily, I have grown tremendously over the past year as a photographer. I have worked hard this year. Probably harder than many people can truly comprehend. I have put in many 80 hour work weeks while still managing to feed my family, have stick battles with Aiden, and shower (most days). I don't really do the things that most people do with their free time; instead I choose to learn and shoot and learn some more whenever I have a few minutes to myself. While I may be a 'newbie' by some standards, my admiration for photography dates back to when I was a young girl. I remember my mother's 35mm Konica and how she always had albums around the house (usually on a shelf high in the hallway closet, inconveniently out of reach). Every time I had a school project that required photos, I would eagerly wait to get one of the albums in my hand a look over each page, carefully selecting the photos I would get to take and keep for my precious project. I can still vividly remember some of the photographs; they stuck with me even though the actual memories were long gone. Later on in life, I worked with a few different photographers hired for various things and while I always absolutely admired their work, I began to realize that I had my own disctinct vision and point of view that I was unable to express through anyone else's work. I had been wanting a DSLR for quite a few years, so I finally decided to bite the bullet and buy a used entry level DSLR with two lenses off of craigslist. Life is short, and I wanted to have books and walls of memories of my son and my life just as my Mom had in those albums I so loved. I guess that makes me a 'momtog' and I'm ok with that. I never once shot my camera in 'Auto' mode. From the day I got it, I knew I would never learn what I wanted to learn by letting my camera do the work for me. I wanted to understand everything about photography, not just carry around a 'fancy' camera. I have an appreciation for the art as well as technical side of the craft that is difficult to put into words. I put my camera in manual mode back in 2011 and never looked back. Without a clue as to what I was doing I learned through trial and error (more errors than I would like to admit), and countless late nights on Google and YouTube and lots of forums. That's one thing that hasn't changed; I am still just as enamored with learning about Photography as I was the day I purchased that used DSLR (just with much better gear, thankfully) and I do not foresee that changing anytime soon. I still have much to learn and I absolutely love that. I am fortunate to have a background in Art that has helped me tremendously in terms of lighting, color, composition, and much more. I believe I have a somewhat refined eye and continue to work on that because we can all stand to keep refining certain areas of our lives. Mamma always told me I had champagne taste! I have a fairly simplistic approach to editing and much prefer to shoot at specific hours of the day to get the look I want to achieve straight from the camera, for the most part. I would say that I gravitate toward a clean film look with a little bit of added contrast and color pop and I would imagine that you will be seeing me hone in on this a lot more in 2015. I can now proudly say I no longer have that craigslist camera and have an awesome lineup of lenses and gear and know what works for me to achieve what I want and why. I know what the sunny 16 rule is and I am pretty darn accurate at guessing my exposure settings without metering even before having to apply it. In 2014 I joined PPA and took the Certified Professional Photographer exam and passed; an achievement I wear proudly. I was also featured in numerous publications and placed in an international image contest in the Wedding category in 2015. I took a leap of faith and opened a studio at the end of this year. It is a small space which will mainly serve as a client meeting space, as I move into a different (and better) type of session experience in 2015. I am currently booking 2015 portrait sessions and space is limited, I recommend inquiring as soon as possible if you are interested in a 2015 portrait session. I do plan on continuing mini sessions, and will be offering two or three dates this year. I will be booking limited portrait sessions in the studio, but still much prefer to work outdoors whenever possible. I also hope to do some in home lifestyle sessions this year; I love capturing people as they are, in their homes or on their properties and seeing and realizing what a day in someone else's life is like. I love learning about the intricacies of families and couples and seeing it all come to life in a series of images. I have learned over the past year that I love fine prints, hate digitals (even though they will still be available for purchase), and I feel I have been doing clients a disservice by not putting the whole experience together by assisting in the ordering process. In 2015, my sessions will be much more personalized with an emphasis on heirloom prints and products. Let's face it, ordering online is a daunting task and how can you possibly make the best decision with no guidance or samples to view? With a degree in interior design, it is a huge passion of mine to be able to help clients select the perfect framed fine print for their home or purchase that large mantel canvas you always envisioned. I have completely revamped my products and will be offering some amazing packages to my portrait clients, with in person ordering sessions to tie it all together. In 2014 I shot my first wedding. Yes, that's right, my first wedding was shot this year, followed by a handful more. It's hard for me to believe I actually tried to talk clients out of booking me for a wedding just one year ago, and now I am gearing up to focus much of my business on weddings in 2015-2016. The moment I showed up to the hotel room where my first bride was getting ready, I knew that was where I was meant to be. The drama, the suspense, the beauty, the emotion. It's truly everything I love about photography rolled into one day, yet each one is amazingly different and unique, so there's never a dull moment. I spent a lot of time in 2014 studying wedding photography through online courses and world renowned wedding photographers. That, combined with the 2014 weddings I shot and my own wedding experience in 2012 led to the creation of some pretty amazing packages for my 2015-2016 couples. Amazing engagement sessions and heirloom albums are just two of the things that set my packages apart. In 2015 I will be welcoming in a brand new website in addition to everything else. Until this point I have been doing everything myself, from logo to website and everything in between and it was long overdue that I had a professional create a cohesive brand and do a complete overhaul for me. 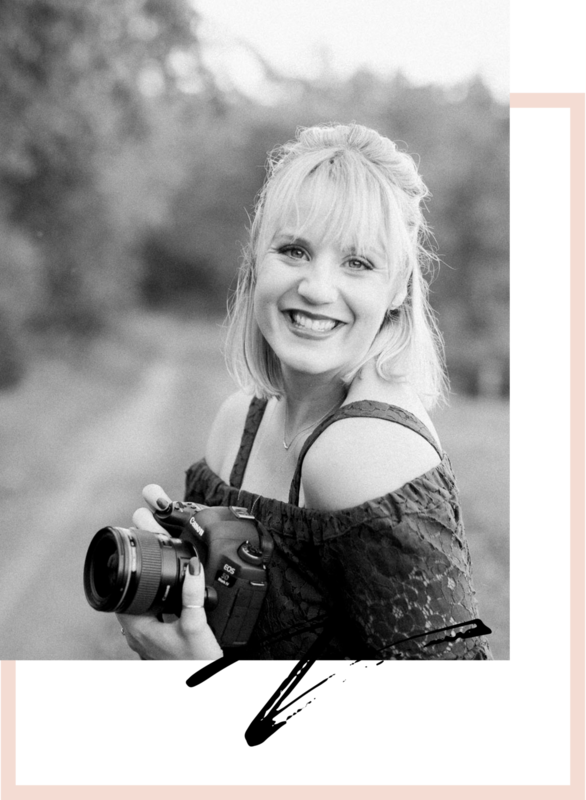 I have been working with the talented Kate Dommel of Homespun Branding Studio to create a fresh new look that speaks true to me and what I'm all about and I am loving the process thus far. I have also added an amazing online management software to my business in December of 2014, which will allow me to be more efficient with scheduling and payments and also allow me a better line of communication and personalization for each client. As I worked through a list of 2015 goals over the past few days, I realize I am leaving 2014 truly inspired and excited for what's to come in 2015. I plan to spend some time this winter on personal projects and loving on my family, playing it a little more low key for the next few months before wedding season picks up in May. I want to get back into the groove of doing a 52 week project (one photo per week) to document my life for myself and for Aiden. I want to shoot more film. It's so common for photographers (or any artist) to lose sight of how it all began. I don't ever want to lose sight of that. I plan to blog much more often; I enjoy writing and miss doing it. I hope to laugh a lot, and do things I enjoy- ski and hike and swim in the ocean and whatever else comes my way, maybe even travel a bit.